The List of Postcodes by County file is a compiled extract from the Royal Mail's Postcode Address File (PAF), Postcode Administration tables and Ordnance Survey's CodePoint OpenData. We have merged the data to create this Postcode to County lookup table. The file is updated every quarter. When you order the List of Postcodes by County file you receive a text based list of all 1.8 million UK Postcodes falling within the appropriate County. 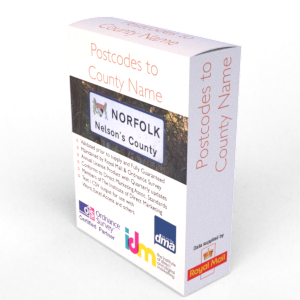 The list of Postcodes by County list is ideal for relating Postcodes and address information to their relevant Traditional Administrative County. The data is therefore essential for allocating customers or sales leads to sales areas which are defined by County or for assessing demand for County based local services. The list of Postcodes by County is supplied as a Comma Separated Variable (CSV) delimited text file using double quotes by default. This field format will open very easily using almost any software application including but not limited to Excel, Word, Notepad, Access, SQL etc. Due to the size of the file, older versions of Excel may not be an option as Excel limits any file size to around 65,000 rows / records. The List of Postcodes by County is by default emailed at the time of order using a secure download link delivery method. If you require the data supplied in another format then we will be more than happy to accommodate you where reasonable to do so at no extra cost. The list of Postcodes by County is licensed annually for each user that has access to it according to Royal Mail Terms and Conditions. Each Postcode Area comprises one or two alpha characters generally chosen to as an extract from the area name e.g. B for Birmingham, CF for Cardiff, CV Coventry etc. In total the UK comprises of one hundred and twenty four postcode areas. Each Postcode Area is made up of dozens of Postcode Districts represented by the first one or two numbers immediately following the postcode area. B7, CV21, SL16 etc. The district's numbers range from 0 to 99. In London a further alpha character is used to divide some London districts into sub divisions (suffixes) e.g. EC1A. There are 2,827 postcode districts. Sectors are numbered 0-9. It should be noted that when sorting postcodes into order, sector 0 is the tenth sector rather than the first! There are 9,487 postcode sectors in the UK. Counties are no longer required or used by the Royal Mail Post Office service as part of a correct postal / delivery address. The Traditional County is the county name most recognised and most used by the public even though the county names technically no longer exist – examples include Berkshire, Middlesex, Yorkshire. This county field is most useful for public facing website applications where users are requested to select a County for an address etc. The Administrative County provides the latest county name for each postcode based upon administrative geography. This field includes unitary authorities where applicable, for example York is within the unitary authority (administrative county) of ‘York’ but in the (Traditional) County of ‘Yorkshire’. Whilst these county definitions are no longer maintained by Royal Mail or Ordnance Survey, we have applied geographic analysis to the data to ensure that every Postcode is allocated to a County.